The Serpent/CHICCHAN trecena ignites our Consciousness for dynamic Spiritual Developments. The Serpent is a symbol of Enlightenment and Illumination. We are Growing to Spiritual Maturity. CHICCHAN is the catalyst that awakens all our Spiritual Gifts of Knowing. CHICCHAN holds the Gift of “Lightning in the Blood.” This is known as the Sixth Sense by the Maya that “bestirs the blood to speak.” CHICCHAN raises our Consciousness to our Connection through the Heart. CHICCHAN is associated with Kundalini energy. Through the Gift of CHICCHAN we will Feel our Way to our Divine Destiny. 6th Uinal: The 6th uinal generates the momentum for a Rhythm and Flow of Movement. This is the energy of the Great Athlete. Like a Dancer who has practiced all the steps for the performance that becomes an Expression of Art. With the Gift of CHICCHAN we will Feel the Momentum of Spirit. 6 Dog/OC will engage the Flow and Momentum of Unconditional Love. 7 Monkey/CHUEN, the Alchemist and Weaver of Time, will establish our balance between the material and spiritual world. 8 Road/EB the Day Sign of the Human will appear in its zenith with the Truth to Believe in our own Divine Destiny. 9 Reed/BEN will complete the Transformation in Harmony and Equity to empower a Divine Family. Road/EB is the Day Sign of Human and the Road of Human’s Destiny. Road/EB is the Sacred Journey every Human makes, and the path defined by the Tzolk’in that fulfills the Human’s Divine Destiny on Mother Earth. We Ascended on 13 Monkey/CHUEN, Knowing our Self as a Divine Creator Empowered by Love. The glyph illustrates Human with the “Road of Destiny” on its head. In the end Human is identified by all the Choices we make. Road/EB guides a New Beginning. Every trecena builds on the Higher Ground of the last Transformation. The Storm/CAUAC trecena offered a Renewal of Faith and Regeneration of Spirit that Inspired the Unbridled Freedom To Be and to Love our Life. EB opens a New Road for a New Way of Living. We get to start over. Our karmic debt is paid in full. We will write the turning point of our own Life Story through Choices we only Dreamed of making before. We have Everything to Gain, and Nothing to Lose in Believing in our Own Dream of Happiness. If we keep asking for Divine Will, we’re Promised more Light, Life, and Happiness than we understood a Human Heart could hold. THE LIGHT AND THE DARK: Storm/CAUAC was a trecena of “Light,” representing “New Inspiration.” Human acquires Wisdom in two steps. First, we’re Inspired by new thoughts and ideas. We are introduced to a new “theory” of Truth. Though, it can only become “Our Truth” through the Wisdom of Experience. Road/EB is a trecena of “Darkness,” the application that will define Truth by our own Experience. The Road/EB trecena will help us Realize our Destiny as a Divine Creator. We’re more than half-way through the 5th Uinal of Empowerment. Number 5 represents the Center of the Cube, the central organizing force that manages Resources for Application. Under the Intention of 5, we take stock of our Spiritual Resources and the Truths that we Believe. We hold new inspiration for the Ways and Means to manifest our Dreams. 9 Sun/AHAU ends the 5th uinal with a Revelation of Power that will motivate us to Complete what we started. 10 Crocodile/IMIX begins the 6th uinal where we will manifest the Momentum of a Divine Flow. A new way of living will become second-nature. When our Heart Believes in the Dream, Love will inspire our own Divine Genius. We will Ascend on 13 Seed/KAN, believing in our own Power to Create our Dreams. We’ll Know our Choice for Divine Will guaranteed we would Know. We’ll Know our Self as the Imperishable Seed that was designed to move beyond every Human obstacle to become what it was Meant to Be. 6 Earth/CABAN – generates the Rhythm and Flow of Movement for a new life on Mother Earth. 7 Flint/ETZNAB – a Reflection of Truth will reveal “all that is” and “all that is not” for the Balance of Divine Justice. 8 Storm/CAUAC – exalted in its zenith position, we’ll be Transformed through the realization that our Faith is turned into Believing in our own Unbridled Power To Be. 9 Sun/AHAU – our Transformation is completed by the Supreme Creator. Through a new Revelation of Divine Will, we will Know what is Meant to Be and the Truth of our own Destiny. The Haab New Year began on February 20, 2019. The Intention for change on a planetary scale is marked by the Number 7, a Reflection of “all that is” and “all that isn’t” for a Balance of Human’s Divine Justice. This is the Year marked for Humanity to Know that we CAN Create our own Reality. Road/EB is the Threshold Journey into the Reality of our Dreams, and the way that life was meant to be on Mother Earth. The Aztec Day Sign is Malinalli, Grass. Grass symbolizes Human’s perennial nature. Even grass that’s been worn down and stepped on will spring to a brand new life again. Sun/AHAU is the Lord of the Tzolk’in, and the Supreme Lord of Creation. AHAU is the Light of Illumination, the Source of Life, Light and Happiness. Life is trained to the Sun, to Live and Create in the Light. When Sun appears we can expect a Revelation, an Enlightenment, or an Epiphany. AHAU is a Day of “Darkness.” Yellow and White Day Signs are “Dark” marking a day or cycle for the Application of Wisdom. Humans are binary creatures who comprehend by learning and doing. Deer/MANIK was a cycle of “Light,” incoming Inspiration that inspired a Meaning and Purpose for Living. Human’s Divine Mission was guided by Deer, the Mayan priest, who serves the Whole through Vigilant Consciousness, leading by example in the Humility of Love. The Deer inspired us to be a Living Sacrifice, to bear the suffering of injustice for a Divine Reason. Creating Love as our Offering, we would always be Atoned – At One in the Creator’s Love. Deer offered the Wisdom of Inspiration. Sun/AHAU will guide the Wisdom of an Experience. It is Right and Good that Sun/AHAU will be our Companion on our first journey as the Deer. The first thing we can know is that every journey of the Deer, our Divine Meaning and Purpose, would be shared by the Creator. The Tzolk’in was a path that was Created for us to share the Sacred Event of each day. Sun/AHAU holds the Authority over all the calendars. They can steal a natural calendar and force us to follow the “man-made” time of the Gregorian calendar, but NO ONE will ever separate us from the Authority of the Light. AHAU is the Master of Everything. Holding the Consciousness of Unlimited Possibilities, AHAU is the Source of Genius for anything. AHAU connects us to the Collective Wisdom of the Above and the Below. AHAU brings the Brightest Illumination to all things. The Sun/AHAU trecena will build the Wisdom of Experience, Serving as the Hand of God. We will be guided by the Highest Authority, the Omega, the All-in-One. The Promise from the Beginning is 13 Road/EB, an Ascension of our Divine Destiny. 1 Sun/AHAU completes the 2nd Uinal of the Tzolk’in. In the harvest cycle of the 260-day Tzolk’in round, we are completing our germination. We made our way through the darkness underground. In the 3rd Uinal of 20-days, we’ve reached the Light. Number 3 holds an Intention of Movement. We are moving in a new world. One sprout looks much like another. We will create who we are by Intention. Tone 8 represents the Highest Illumination of Solar Light, the hour of the zenith. Most of the festivals and Sacred Ceremonies are observed on Tone 8. 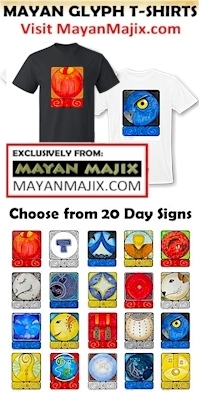 The Maya observe 8 Deer/MANIK as the Day of Initiation of the Mayan priest. Tone 8 is the Day of Transformation by Divine Intervention. 6 Serpent/CHICCHAN – Lights the Fuse of Spirit; “lightning in the blood” will awaken our Sixth Sense of Knowing. Tone 2 introduces the Consciousness of Duality. We identify our Self, apart from The Creation. We were inspired to create something. Tone 2 is a Day of Personal Discernment of an Intention that will guide our Spirit. On Tone 2, we imagine what it could be. This Time for figuring things out is important. It’s a Choice we make of “to be or not to be.” We get to choose what will manifest in our lives. When we are Conscious our natural Choice is to add something we Love. It’s a day to be Conscious that we’re choosing, through the thoughts we are imagining. If we want to create more Love, we need to focus on something we Love. On Tone 2 we consider our own Expression born of an Inspiration to Create. We don’t always choose for Love. Sometimes we choose what the world expects, or create to prove a point, or we hurry to invest our effort before someone else thinks of it. On Tone 2 it’s important to discern the meaning and purpose behind the creation. Love is the Reason that will manifest our Creation. Star/LAMAT is the Cauldron of Creation, like the Star Nurseries of the Universe. LAMAT’s totem, the Rabbit is Overflowing with Love, Multiplying to Abundance. LAMAT is a day of “pure luck.” We can find something we Love close at hand that we can focus on, and it will be Multiplied to Abundance. LAMAT is associated with Instant Manifestation. What we hold in our thoughts is manifested in Spirit. In the Pure Process of Creation, if we See it and Love it, it’s ours… just waiting to materialize in the realm of physicality. We have to uphold the pillars of our Dream, to uphold the Creation that exists in Spirit. We have to weave it together in our imagination, and Believe that what we create in Spirit will be Balanced Below. We uphold the pillars of Creation through the Vigilance of our Conscious thoughts. We have to focus on what we Love, not what we Don’t Love.